Collaborations Workshop 2017—keynote speakers, panels, freebies and even more reasons to attend! Jisc offering a travel bursary for a PhD student to attend CW17 - apply now! 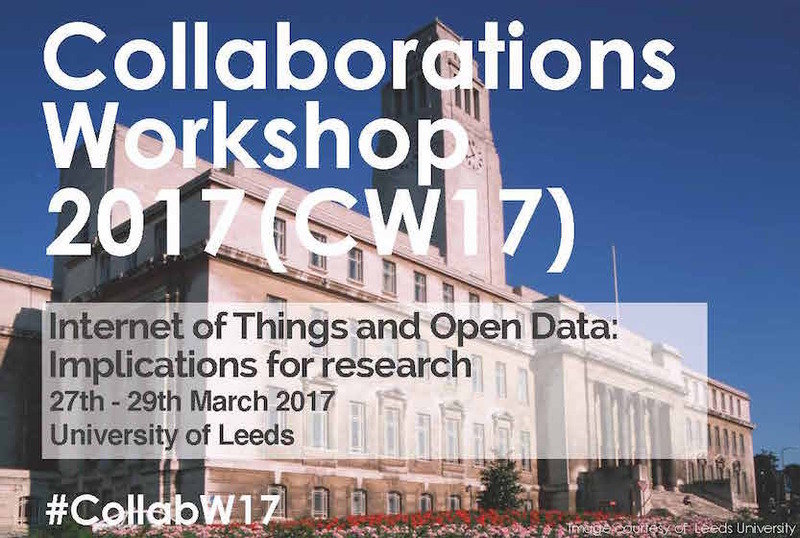 The Collaborations Workshop 2017 (CW17) takes place on the 27–29th of March 2017 at the Leeds University Business School. This is ‘The’ event for getting up to speed with the Internet of Things (IoT), Open Data and Software Sustainability. Our Internet of Things (IoT) keynote is Usman Haque from Umbrellium, who has been there from the very early days of IoT and will inform us of current trends, thinking and use cases in the space. Our Open Data keynote is Tom Forth from imactive, who has a vast amount of experience using Open Data to make cities truly smarter and other applications which he’ll share with us at CW17. We are running two panels at CW17: one focused on IoT and Open Data and what these areas mean for Research, and another on Software Sustainability. We have excellent panelists lined up to answer your questions, inspire and inform—please take a look at the CW17 agenda to find out who is on the panel. We thank our sponsors for their kind generosity. Attendees have free SparkFun developments kits and Cloud time to look forward to from Microsoft, free books from Packt publishing, Hackday prizes supported by Jisc and, if they are quick, swag from GitLab. From speed blogging, collaborative ideas, mini-workshops, social/cultural events and lightning talks, CW17 will be an immersive experience to get up to speed with the latest trends in research software, build potential collaborations and experience unconferencing. You’ll gain a refreshing perspective and ideas you can take right back to your own work. The CW Hackday (starting on the evening of the 28th of March) will be the place to pitch ideas, form teams, bring your own data and build a multifaceted group for a chance to win secret prizes (awarded individually to each member of the team)! It’s also a great opportunity to learn and interact with others and perhaps even form a longer-term collaboration. We also recently had long time Institute Fellow, Melody Sandells, writing for the Institute's blog: ‘Why attend a Collaborations Workshop?’—packed with even more reasons to register! You have nothing to lose and everything to gain: register today for Collaborations Workshop 2017 and get up to speed with the latest in research software!